Moose Hunting - North America's largest big game animal. From Alaska to Newfoundland Canada, we've compiled a great selection of moose hunts, 80 in total. Shiras, Alaska-Yukon, and Canadian Moose hunts from reputable big game hunting guides and outfitters for that once-in-a-lifetime hunting experience. 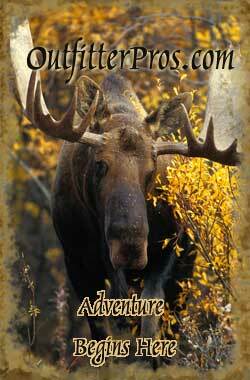 Guided and self-guided (drop camps, float trips) bow and gun moose hunts. Moose Guide (Alces alces) The moose is the largest member of the deer family, Cervidae. It is found in North America from Alaska to eastern Canada, south into the northwestern United States, and in Europe and Asia from Norway to Mongolia. The name moose is an American Indian word. The moose is a massive animal with long legs, a large head, and an elongated, overhanging muzzle. A long flap of skin, called the bell, hangs beneath its throat. Large bulls may be 3.1 m (10 ft) in length, plus a short tail, and up to 825 kg (1,800 lb) in weight. Bulls typically also have large, broad, spoon-shaped spiked antlers, which may be 1.8 m (6 ft) across. Of the four species of moose, the Alaska-Yukon moose is the largest, bulls can weigh in excess of 1400 pounds and stand 7 1/2 feet at the top of their hump. They inhabit Alaska, the Yukon and the western regions of the Northwest Territories. The Eastern Canada moose lives in more heavily timbered areas, and can be found in the Canadian provinces of eastern Ontario, Quebec, Newfoundland, and in the United States can be found in Maine and occasionally down into Massachusetts. The Shiras moose inhabits the southeastern regions of British Columbia and southwestern Alberta, as well as western states of Washington, Idaho, Montana, Wyoming, Utah and Colorado. The Western Canada moose is the second largest specie, and primarily inhabit areas of the Northwest Territories, British Columbia, Alberta, Saskatchewan, Manitoba and a few have been seen in the northern states of the USA. Gun and Bow hunts in Alaska, Maine, British Columbia, Yukon, Ontario Canada, and more.